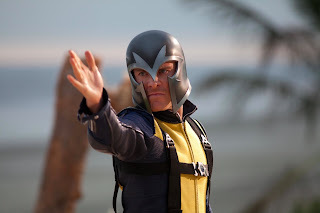 Ever since it was first announced that Michael would be Magneto in X-Men: First Class, I have patiently waited for this day! Although I had no interest in midnight viewings, I'm very excited about catching it at the 7pm screening tonight at my local theater with a Fassy friend. Today, millions of people will come to learn about this guy named Michael Fassbender, and today will mark the day that the face of the fanbase will change. This is both good and not so good as it is wonderful that Michael will gain a lot of new fans and grab even more attention from top studios in Hollywood to hire him for exciting projects. But for us long time fans who have enjoyed him and his work pre-Hunger, might be feeling a little bittersweet because our secret about what we've known all the long, has been unveiled to the rest of the world. What have we known? Michael is multi-dimensional, charismatic, talented, kind, handsome, funny, intelligent, hardworking and deserving of all that is happening to him now. I'm sure most of you will be seeing X-Men today and over the weekend, so please feel free to post your review of the film right here. I will post my review as well, so watch out for it later tonight or on Saturday. This is a great post Simone :). "Michael will gain a lot of new fans" You are totally right. Here in france, I can tell you that he already gained a lot of new fans since 06/01/2011. It's so suprisingly good and not so good ^^. @AlexaAwesome‎: "michael fassbender looks like he has 500 teeth and each one of them is glorious ahhh"
@imashortie‎: "Omg Michael Fassbender is Mr Rochester?!?! Oh my holyshit ok i must watch Jane Eyre no matter what now." @Brian_Rosenthal: "Michael Fassbender for President"
@BRINGHIMTOME: "Michael Fassbender is possibly the most handsome man I have EVER laid eyes on. *faints*"
@csweda‎: "Seriously, Michael Fassbender is so badass - he's the perfect leading man and clearly a dynamic actor. Cast him in everything!"